Tampa Bay trout season officially opened January 1st and the bite has been on fire with plenty of keepers making it on the dinner table. 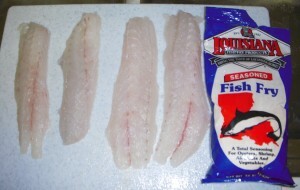 We have been fishing Tampa Bay waters 2′-4′ feet with live shrimp and artificial bait. When fishing live bait, shrimp is the go to bait. I like to fish 25lb Berkley fluorocarbon leader under a popping cork with a #1 Daiichi circle hook. A trick to fishing shrimp on a cork is to give your line a jerk and the cork will make a popping sound. The idea is create a sound to get the attention of the trout in the area. When fishing Tampa with artificial baits, soft plastics are hard to beat. My favorite color is white. I rig them with a weedless weighted hook. Keep an eye on the water temperature. The cooler it gets, the slower the presentation. 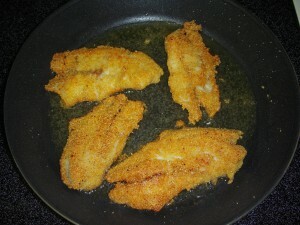 There are many ways cook trout but its hard to beat it fried. I like to use a Cajun flavored corn meal. I prefer the corn meal over bread crumbs because it creates a lighter texture. Just wash the fillets then roll them in the corn meal. Get a frying pan with a little vegetable oil and cook till golden brown. 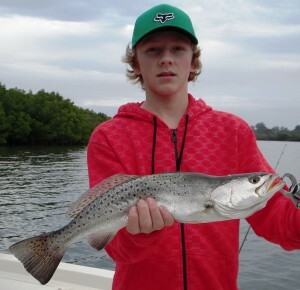 Legal Tampa Bay trout size is 15″-20″ and a bag limit of 4 per angler. Be sure to only keep what you are going to eat and save the rest to be caught another day. To book a Tampa fishing charter, call Tampa Bay fishing guide Capt. Will Shook.